Rio de Janeiro (AFP) - Brazilian taxpayers hoping to see the Mane Garrincha stadium, expensively renovated in the capital Brasilia for last year's World Cup paid off, needn't hold their breath as it won't happen in their lifetime, authorities say. 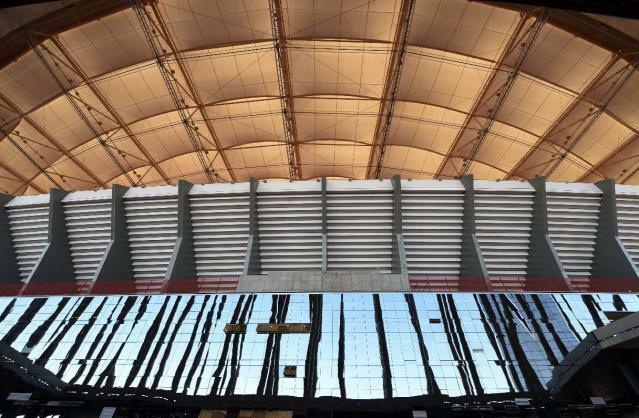 According to the capital's public accounts office (TCDF), footing the bill for the publicly-funded stadium, refurbishing an original structure built in 1974 for some 1.9 billion reais ($900 million), will take centuries rather than decades. O Globo daily reported the stadium earned just 1.3 million reais of rental income in the first year following renovation completed some three times over budget just ahead of the 2013 FIFA Confederations Cup. The spiraling costs made the venue the world's second most expensive soccer stadium after English sporting shrine Wembley. The Tribunal confirmed Monday to AFP the tiny fraction of cash raised over the year when asked to comment on a Globo report signalling that the overall bill would at that rate not be paid off for 1,000 years. The stadium, named after 1960s superstar Garrincha and also known as the National Stadium, is set to become a white elephant given the city's lack of a top league team. Gil Castelo Branco, spokesman for pressure group Contas Abertas, told AFP he was pessimistic. "Brazil made a mistake in insisting on too many World Cup venues. There are no teams in venues such as Brasilia -- so it is liable to end up, as we warned all along, as a white elephant. There is almost zero chance of viability," Castelo Branco told AFP. "You may get a Paul McCartney once in a blue moon -- but most acts will play Rio or Sao Paulo," added Gastelo Branco, though the former Beatle did play the Mane Garrincha last year on his latest tour. Local authorities hope clubs from other cities use the ground -- as Rio side Flamengo did sporadically last season -- providing one revenue stream. Castelo Branco said politicians had overreached themselves in thinking the stadium could be a long-term going concern. "It was a political decision and it was a mistake. It cost too much and the country has other, bigger priorities in terms of health provision and education. "The politicians sold people a lie when they said the Cup would be financed through private cash."